Latrobe Dentist, Dr. Christopher Mucci, has been providing quality dental care to the residents of Latrobe and surrounding communities for nearly 2 decades (since 2001). Dr. Meghan Campfield has joined Dr. Mucci to create one of the premier dental practices in the region. We are located right in the main downtown area of Latrobe with many close parking areas. Our centrally located Latrobe dental office makes us an ideal practice for residents in Latrobe, Derry, Greensburg, Ligonier and Mt Pleasant. Unlike other dental practices, we regulate the number of dental patients we see on a daily basis to make sure each patient is receiving the attention and customized dental care that they deserve! The dentists, hygienists, and the staff have formed true bonds with their patients, affording them a chance to watch generations of families grow throughout the years. Part of our commitment to serving our patients includes providing information that helps them to make more informed decisions about their oral health needs. This website is a resource we hope you’ll find both useful and interesting. 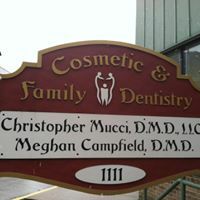 Latrobe Dentist, Dr. Christopher Mucci is dedicated to family dentistry such as Exams, Teeth Whitening, Veneers and more. We are looking forward to your visit to our Latrobe, Pennsylvania dental office.